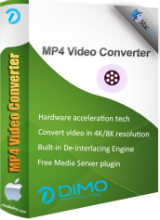 Dimo MP4 Video Converter 4.2 was available as a giveaway on June 28, 2018! How would you improve Dimo MP4 Video Converter 4.2? I converted a bunch of flash video files to .MP4 with this program. The MP4 video files turned opt being about 10 times the size to the original flash files. Also, there is no batch file section function. You can select an entire directory but you will still need to click a START button to start the conversion for each file in the directory. I'm not sure if this software is ready for Prime Time yet. It doesn't work well for my needs. I converted a bunch of flash video files to .MP4 with this program. The MP4 video files turned opt being about 10 times the size to the original flash files. Also, there is no batch file section function. You can select an entire directory but you will still need to click a START button to start the conversion for each file in the directory. I'm not sure if this software is ready for Prime Time yet. It doesn't work well for my needs. mousing over it give you a "pointing finger" pointer. seedo, we <i>did</i> read the readme; it's just that the publisher did a remarkable job of disguising the fact that the "Get Free LIcense Code" text on their giveaway page is clickable, as it's neither styled like a button nor does mousing over it give you a "pointing finger" pointer. I think I'll stick with RipBot256. It's free and I have full control of everything including 4k, correct conversation of fps, audio delay, Trimming, TV to PC etc. There's always Handbrake - it's always free probably does a much better job that this tool. In antwoord op wat Steve heeft geschreven 10 dagen geleden. In response to what Steve wrote 10 days ago. The 43 "flat screen that the Aldi has offered about a month ago can handle this film: Don Camillo 4 Monsignore ma non troppo (1961) 1920x1080p AVC DTS AC3 Bluray-mkv, size 14.033.634 kB, MKV with separate subtitles.The same now the MP4 converted movie with embedded subtitles, with the same format and that is not sucked out of my thumb. The 43-inch Medion flatscreen can play both movies, MKV with separate subtitles, MP4 with embedded subtitles. In antwoord op wat Steve heeft geschreven 10 dagen geleden. In response to what Steve wrote 10 days ago. Hadrianus, My TV is a 40" Samsung 3D Smart TV, and doesn't want to know .MKV at all, even from a movie on a USB memory stick, I also have a Chromecast so there are ways around this, - very disappointed with this model TV as it always tells me those codecs are not supported and there is no software upgrade for the TV Reply | Comment by Steve – 10 days ago Answer. The 43 "flat screen that the Aldi has offered about a month ago can handle this film: Don Camillo 4 Monsignore ma non troppo (1961) 1920x1080p AVC DTS AC3 Bluray-mkv, size 14.033.634 kB, MKV with separate subtitles.The same now the MP4 converted movie with embedded subtitles, with the same format and that is not sucked out of my thumb. The 43-inch Medion flatscreen can play both movies, MKV with separate subtitles, MP4 with embedded subtitles. "Something I do not understand. A video with a higher resolution(4096) takes almost the same space as a file with lower resolution(640)." The short answer is that's because they're encoded differently. If you were using a 4k display, & took screen shots of video playing full size, the screenshot image file of a 4k video would be larger than the screenshot of 1080 video would be larger than 480 video and so on -- that's common sense since the 4k image would contain many more pixels [data] than the other 2 sizes. Logically the number of images [frames] per second also makes a difference in the size of a video file, since storing 10 images takes up less space than storing 30. This is what you'd expect. The actual file sizes you see however reflect different methods & amounts of video compression. With video compression the efficiency of the method [codec] matters, as do the quality-related settings. The quality settings generally work similar to those same settings with MP3 audio files, in that the lower the quality, the more data that gets tossed out, & because of that, the lower the quality, the less the results match the original. Comparing different frame size videos encoded the same way gets a bit more complicated, since the bit rate that's set will vary, depending on how much data has to be moved from the file to the display, but generally a DVD encoded to AVC at original quality might be around 2GB, while the 1080p Blu-ray version might be around 25 - 35GB. Ootje, <i>"Something I do not understand. A video with a higher resolution(4096) takes almost the same space as a file with lower resolution(640). "</i> The short answer is that's because they're encoded differently. If you were using a 4k display, & took screen shots of video playing full size, the screenshot image file of a 4k video would be larger than the screenshot of 1080 video would be larger than 480 video and so on -- that's common sense since the 4k image would contain many more pixels [data] than the other 2 sizes. Logically the number of images [frames] per second also makes a difference in the size of a video file, since storing 10 images takes up less space than storing 30. This is what you'd expect. The actual file sizes you see however reflect different methods & amounts of video compression. With video compression the efficiency of the method [codec] matters, as do the quality-related settings. The quality settings generally work similar to those same settings with MP3 audio files, in that the lower the quality, the more data that gets tossed out, & because of that, the lower the quality, the less the results match the original. Comparing different frame size videos encoded the same way gets a bit more complicated, since the bit rate that's set will vary, depending on how much data has to be moved from the file to the display, but generally a DVD encoded to AVC at original quality might be around 2GB, while the 1080p Blu-ray version might be around 25 - 35GB. mike, "because they're encoded differently." I did selected the same profile. At first I converted at high resolution 4096. After it was finisched, I loaded the same originals again. And ONLY selected a different resoltution, 640. All other setting on that profile were not changed. If I did selected a different profile, I would understand. Same profile, different reoslution, almost same size of file. mike, "because they're encoded differently." I did selected the same profile. At first I converted at high resolution 4096. After it was finisched, I loaded the same originals again. And ONLY selected a different resoltution, 640. All other setting on that profile were not changed. If I did selected a different profile, I would understand. Same profile, different reoslution, almost same size of file. Ootje, what you are missing is ALL the output presets have common, insanely HIGH preset and default bitrates... YOU MUST KNOW AND MANUALLY SET THE OUTPUT BITRATE REQUIRED FOR THE SPECIFIC CODEC AND VIDEO DIMENSIONS INCLUDING FRAME RATE THAT YOU ARE PRODUCING. If you do not you will get the codec set to multiple megabits per second and that will often produce far BIGGER files than inputs when say converting an x264 MP4 to say an x265 mkv file. It is a LONG standing design fault with ALL of the Dimo products! Mainly because they ALL use the same conversion engine and just tweak the acceptble input parameters i.e. MP4 or MTS or HD or Bluray Disc or DVD or the full product VideoMate. This product is not for normal computer users, only people familar with beta testing for a living are likely to be able to get the most out of these products as they are used to trying every possible input selector box and seeing if it is also a conventional input box that you can type a free form value into as well. mike, the correct answer is the default bitrate settings of Dimo converter engine is not related in any way to the chose profile template or the video dimensions and are wholy inappropriate for anything other than small clips at high DVD quality profiles or moderate Bluray disc profiles and NOT for any efficeint coding like AVC x264 or HEVC h265 for internet use. So end up with high efficiency codecs being instructed to encode with the worse efficency than Mpeg2. mike, ....methods & amounts of video compression......H265 has a larger compression technique that H264, which makes the difference in size. 7 Dec. 2017 - Microsoft no longer supports the HEVC / H.265 codec in Windows 10.
mike, ....methods & amounts of video compression......H265 has a larger compression technique that H264, which makes the difference in size. 7 Dec. 2017 - Microsoft no longer supports the HEVC / H.265 codec in Windows 10. TK, "YOU MUST KNOW AND MANUALLY SET THE OUTPUT BITRATE "
You're right. I did not set/read the specific settings. And set it to 4096. Nothing else. And the second time it choose the same profile and set it to 640. nothing else. But I did not looked at the other settings, changed or not changed. I assumed that they were the same. So at the end I was wondered about he size. Never thought of it that way but I guess you're right. Most freeware & many payware video apps use the ffmpeg code, so the differences between app A & app B often boils down to the GUI & the options it permits. 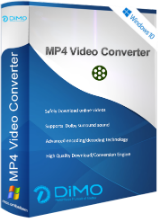 Software like Dimo MP4 Video Converter is generally easier to use because there are fewer options, while freeware apps tend to offer more options, with a steeper learning curve. If you don't mind that learning curve, then you might sometimes get better results using one of the many freeware apps, assuming you make good use of the increased number of options. That said, why or why not Format Factory specifically? IMHO it's one of the nastiest apps when it comes to the impact installing it has on Windows, & Windows' media handling ecosystem. If they'll work for you, XMediaRecode & Simple_x_264 Launcher in contrast are both portable, while video software like Dimo's is pretty much self contained, with little impact on Windows. Jim B, Most freeware & many payware video apps use the ffmpeg code, so the differences between app A & app B often boils down to the GUI & the options it permits. Software like Dimo MP4 Video Converter is generally easier to use because there are fewer options, while freeware apps tend to offer more options, with a steeper learning curve. If you don't mind that learning curve, then you might sometimes get better results using one of the many freeware apps, assuming you make good use of the increased number of options. That said, why or why not Format Factory specifically? IMHO it's one of the nastiest apps when it comes to the impact installing it has on Windows, & Windows' media handling ecosystem. If they'll work for you, XMediaRecode & Simple_x_264 Launcher in contrast are both portable, while video software like Dimo's is pretty much self contained, with little impact on Windows. MikeR, I couldn't believe the creator was offering a one-format converter after reading the description, so I checked out the comments to see what I was overlooking. Turns out it is a dumb as I thought. Thank you so much for the excellent description - I won't waste my time with this. MikeR, yeah I refuse to waste space and time even trying their cut down single file spec products I have one of their previous VideoMate version from a previous giveaway and do not ever have the need to use it, having much more joy with always free X-Media recode. The fact they also bundle two useless extra products of Downloader and a barely functional web server that can only be pointed at a folder with media files in it and once its been started there is no stop facility apart from shutting down the program and no non-android based smart TV can stream the media from their server... and every set of folders on differnt drives you want to serve has to be specified individually which then spawns a fresh instance of their basic web server on a different port... not on the same port and linked into the presented heirachy... unusable! 4 K Cinema, 4096x2160 1.9:1 4 K DCI 4K UHD (4K UHD.NL). The result: a black bar, a pink broad above and below the image. MikeR, 4 K Cinema, 4096x2160 1.9:1 4 K DCI 4K UHD (4K UHD.NL). The result: a black bar, a pink broad above and below the image. 4K ULTRA-HD 3840x2160 16:9 Fits in the picture. The publisher's giveaway page appears to be missing the license code. If you look at the HTML source of that page, you can see the license info popup, but it says "Hi folks, the giveaway campaign is expired" where the code should be. The publisher's <a href="https://www.mediadimo.com/world-cup-giveaway-offer">giveaway page</a> appears to be missing the license code. If you look at the HTML source of that page, you can see the license info popup, but it says "Hi folks, the giveaway campaign is expired" where the code should be. Jim Stone, If I recall correctly their code retreival page is browser specific and on some brrowsers does not display the license on pressing the proper button and on other browsers the same page does work. Of course it may actually be broken! Having giveaways where the vendors define the key distribution method are known to get things wrong! as a time-limited offer! DON'T DOWNLOAD OR INSTALL ANY, ANY PROGRAM UNTIL YOU VISIT THE HOME PAGE THAT IS LISTED! Rick Williams, I Strongly Suggest that you, and EVERYONE ELSE TO CHECK OUT THE HOME PAGE LISTED ON THE UPPER RIGHT... It Reads:System Requirements: Windows 10/8.1/8/7/Vista; DirectX 9.0 or above; >1.5GHz Intel or AMD CPU; 50G free space; 1Gb RAM Publisher: Dimo Studio Homepage: https://www.mediadimo.com/mp4-video-converter File Size: 56.3 MB Price: The program is available for $55.95, but it will be free for our visitors as a time-limited offer! DON'T DOWNLOAD OR INSTALL ANY, ANY PROGRAM UNTIL YOU VISIT THE HOME PAGE THAT IS LISTED! Not the most polished app of this sort, but it gets the job done. The application can be deployed in a matter of seconds thanks to a typical installer and is by no means a sophisticated application regarding functionality. The user interface looks quite decent and it provides easy access to all the functions, however, we have experienced a few annoying glitches and delays during our tests. Not the most polished app of this sort, but it gets the job done. The application can be deployed in a matter of seconds thanks to a typical installer and is by no means a sophisticated application regarding functionality. The user interface looks quite decent and it provides easy access to all the functions, however, we have experienced a few annoying glitches and delays during our tests.